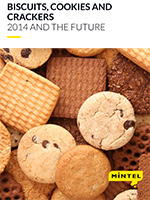 This global annual market overview will provide you with an in-depth review of the key issues in the global biscuits, cookies and crackers market through 2014 as well as our forecast for what will happen in 2015 and beyond. Russia and Asia represent good opportunities for the biscuits, cookies and crackers category on account of the high level of consumption in Russia and the healthy growth outlook for Asian markets, in particular, South East Asia, China and India. Overall, the rates of growth and consumption are buoyant and the category as a whole is performing well. Despite rising health consciousness, consumers are still leaving room in their diets for indulgent treats, and biscuit and cookie trends continue to cater to this need, with health focussed, better-for-you (BFY) varieties remaining niche. Biscuits have traditionally enjoyed strong associations with hot beverage consumption. As this habit is declining in some developed markets, and particularly amongst younger consumers, brands in the category need to establish strong links with new consumption occasions. Biscuits, cookies and crackers are increasingly competing with salty snacks as cracker chips and even cookie chip innovation continues in North America. Such reinvention is an important means of maintaining sales volumes and finding new growth opportunities for the category.